The fireplace is supposed to be an eye-catching centerpiece. But if yours is grabbing attention for all the wrong reasons, consider giving it a beautification with stylish tile. 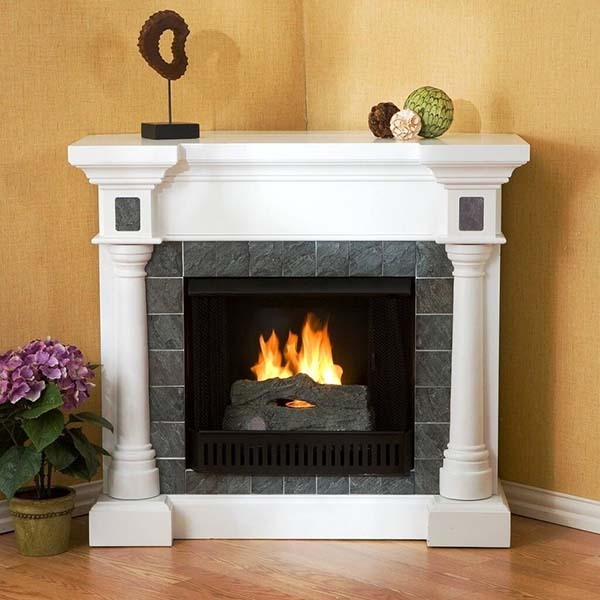 There are tons of great options available that will convert a sad fire surround into a feature you will simply love. Are you in? 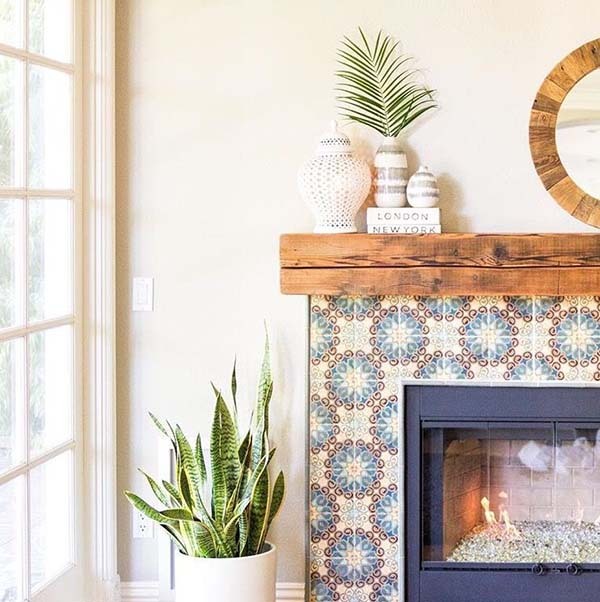 These 26 Amazing fireplace tile ideas will inspire you to design a hearthside worthy of cozying up to year round. 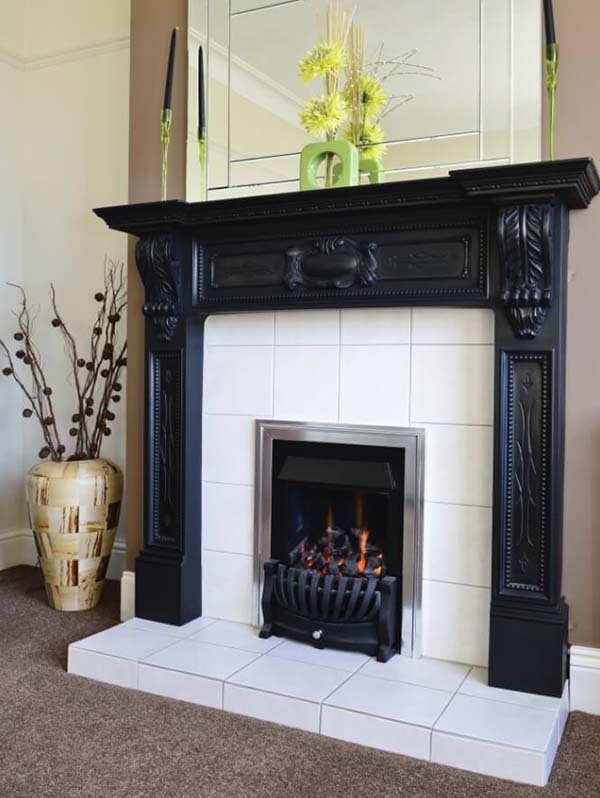 If you want to give your fireplace a simple and stylish look, a great choice would be ceramic tiles. They are one of the most common modern fireplace tile ideas. The ceramic tiles are usually offered in a wide range of colors and patterns as well as shapes (such as a subway tile fireplace). 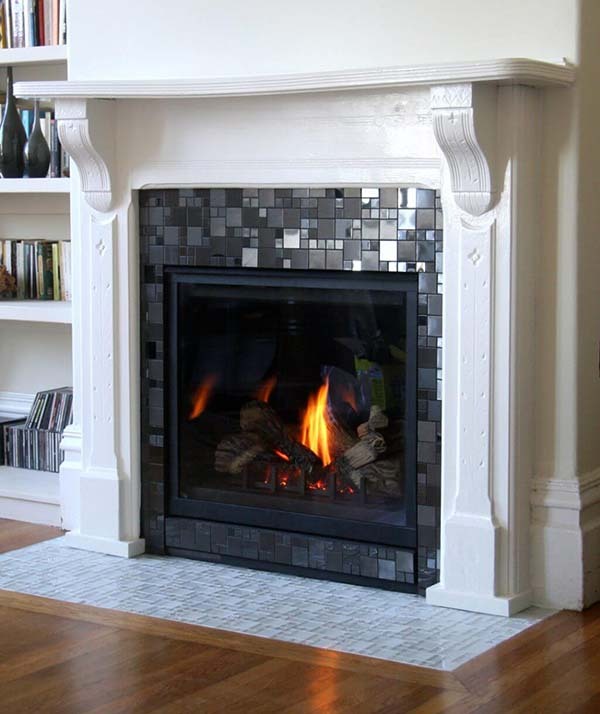 Why don’t you give the fireplace at home a timeless, chic, and luxurious look by using a marble tile fireplace surround? 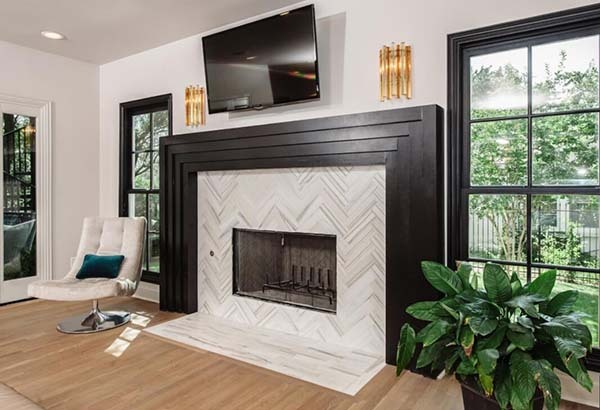 People usually love the tile fireplace ideas with marble as it makes a strong statement and adds some additional glamour and versatility to the living room. 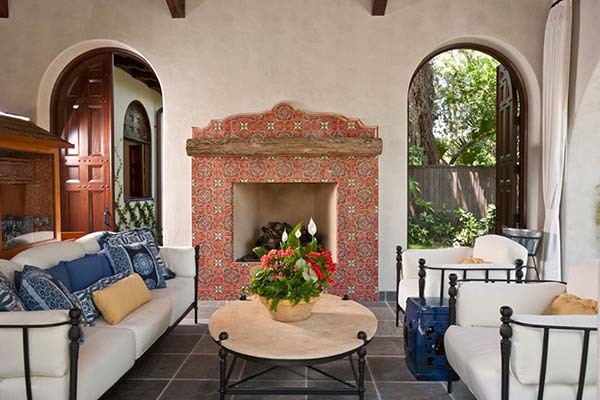 Cement tiles have been embellishing upscale floors for centuries mainly because they are very durable, and come in a broad range of colorful patterns. 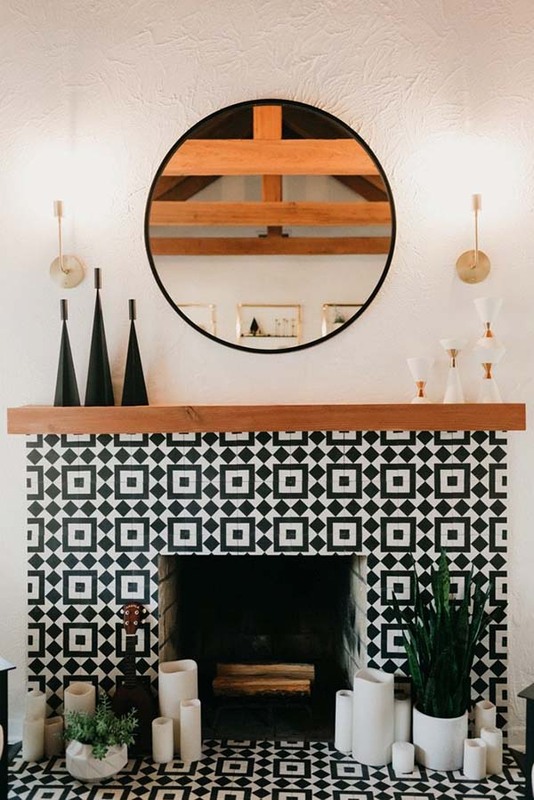 Along with the other tile fireplace surround ideas I’ve prepared for you, consider using cement tiles for your fireplace to create a stylish centerpiece in the house. I know that even though, the internet is full of tile around fireplace ideas, sometimes is quite hard to find something you really love and that makes you feel warm and cozy. Take a look at this pretty Moroccan inspired print – the colors, the pattern, and the natural feel of the wood grain finish is just fantastic! If the matchy-matchy décoration is not your thing, spice the things up a little by combining two different types of tile, for instance, Carrara marble with a glass mosaic. 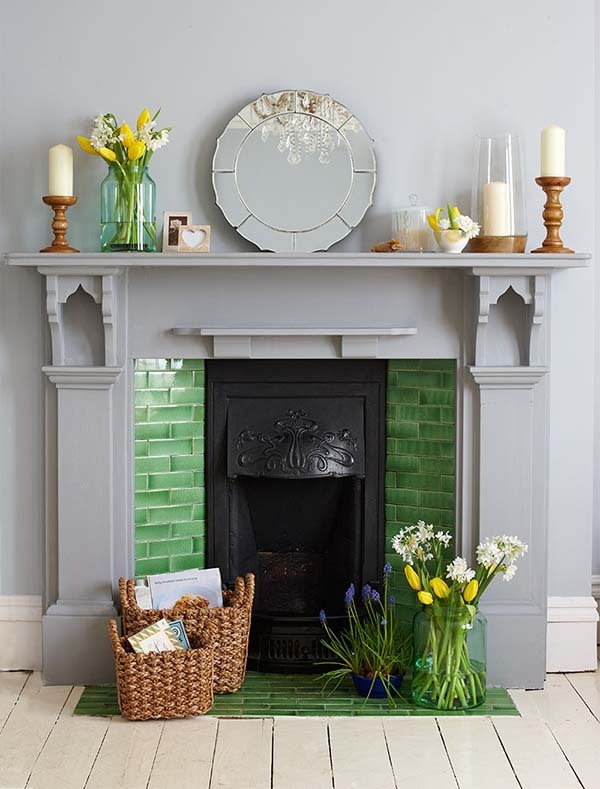 …and here is something for the fans of the rustic tile ideas for a fireplace! This farmhouse inspired, features a black tile back panel and a white tile front panel in a charming herringbone pattern. We love how the wood mantel jumps out against the crumbly, white brick. 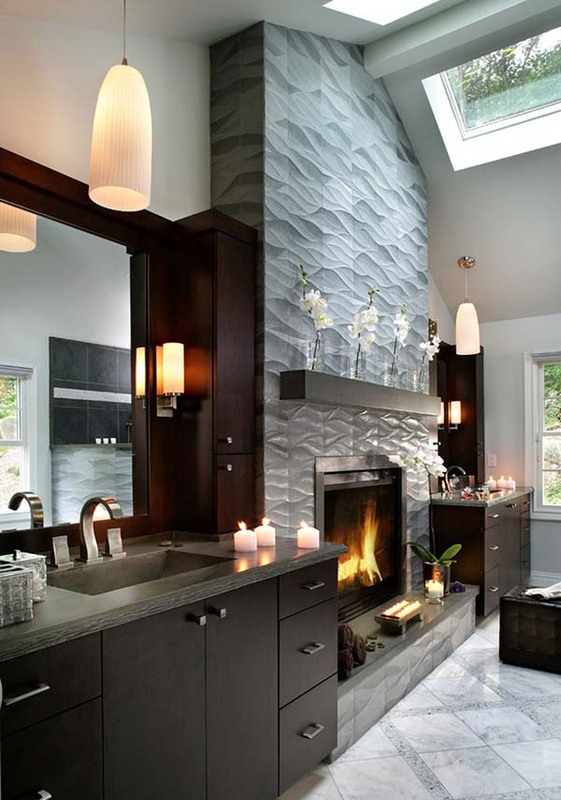 Definitely one of my favorite fireplace tiles surrounds ideas! 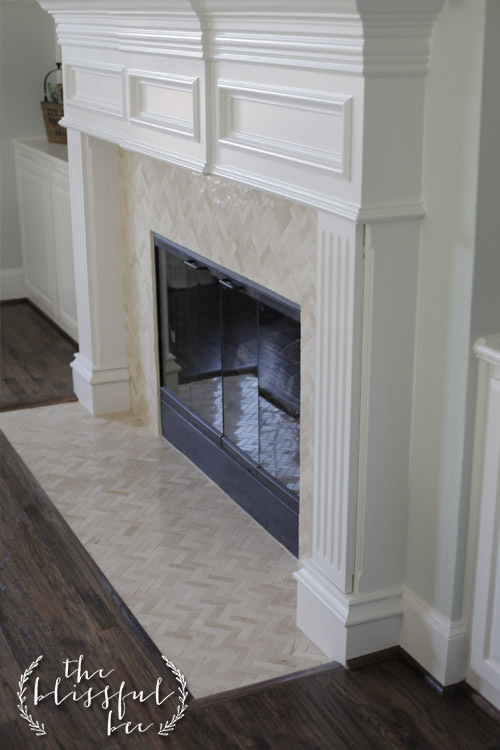 Porcelain tile is now the go-to product for fireplaces. First of all, it is very versatile, and then, the tiles from porcelain are available in a wide range of colors and shapes and a variety of coatings to be incorporated such as metal, linen, and leather. 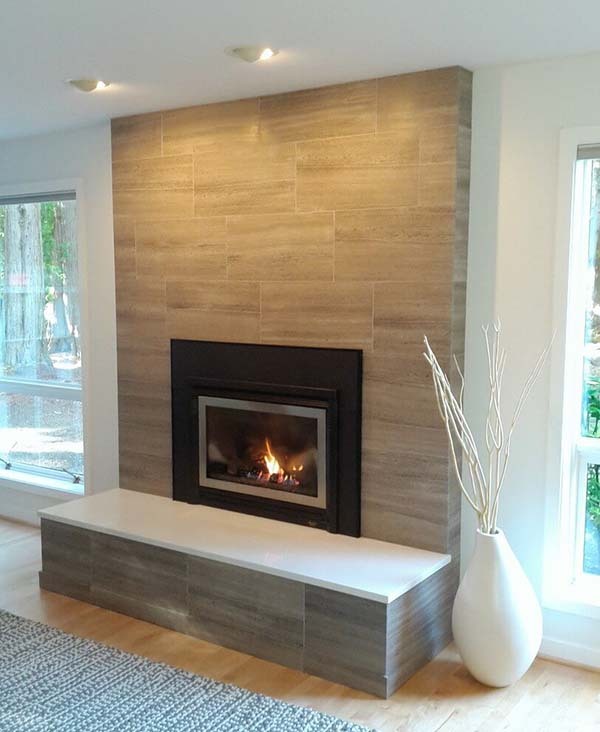 If your home has contemporary look, consider covering the entire wall behind the fireplace with porcelain fire tiles in large format, executing one of the timeless fireplace tile surrounds ideas. When I decided to refresh my fireplace, I first spoke to a friend of mine who’s an interior designer. He suggested me to find and select some contemporary fireplace tile surround ideas as it would help me to modernize the entire living room. The avant-garde gas fireplaces are welcomed in any home thanks to their easy operation and most importantly the warmth they bring. Great example of fireplace with windows on each side. Keep in mind that If you are creating a floor covering in the room where is the planned fitting of the fireplace, you need to beware of the strength of the relevant supporting substrate fireplace. If you don’t want like the ceramic and the cement, why don’t you look for some stone tile fireplace ideas? It can also create a contemporary unpretentious look, without needing a lot of maintenance. This one is built-in corner fireplace. 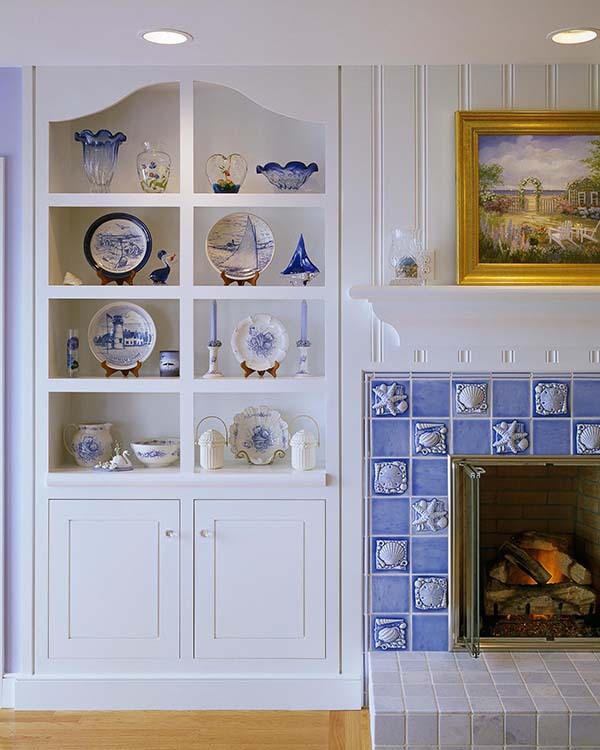 The fireplace reflects the strong beachy vibe of the living room with Cobalt blue tile. In order to keep the main focus on the decorated surround, the mantel decor is minimalistic. 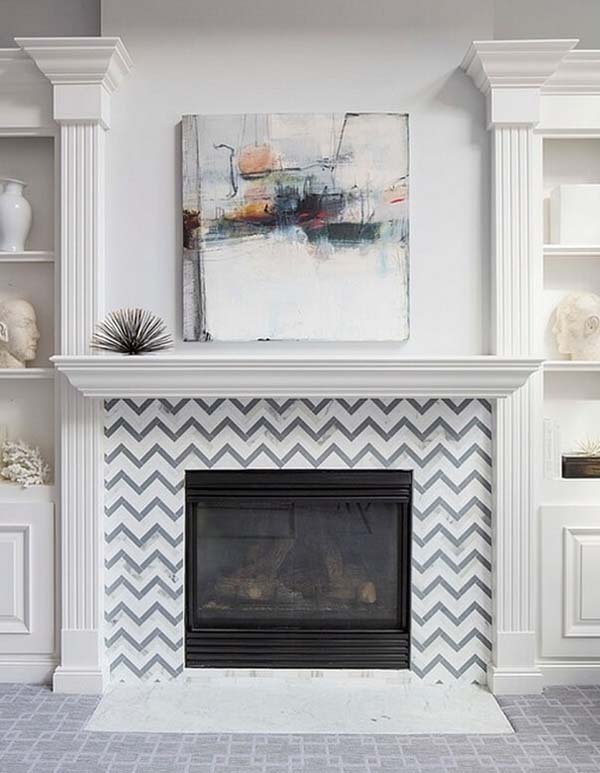 One of the easiest fireplace design ideas with tile is to make a strong contrast between the fireplace surround and the mantel. You can do it with the colors, the shapes, or the materials used. 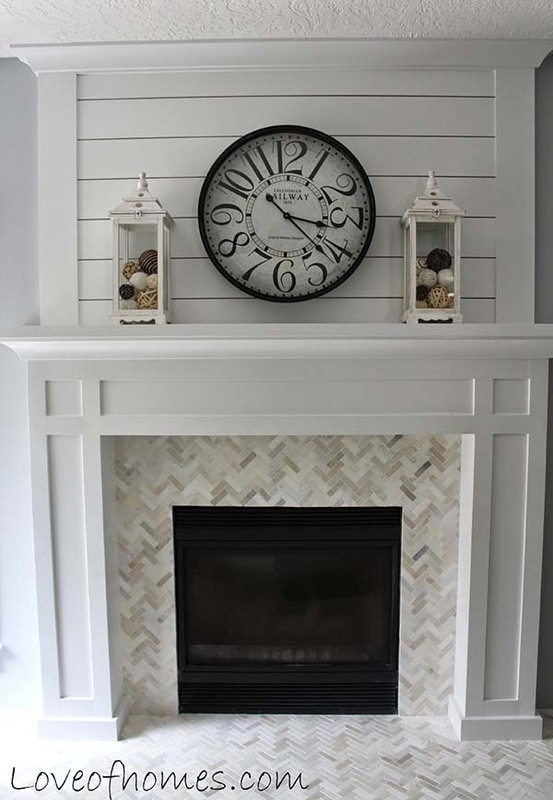 These stylish 1×3 inch marbles tile with a herringbone pattern transform the boring classic fireplace into a wonderful focal point that makes the entire space warm and cozy. 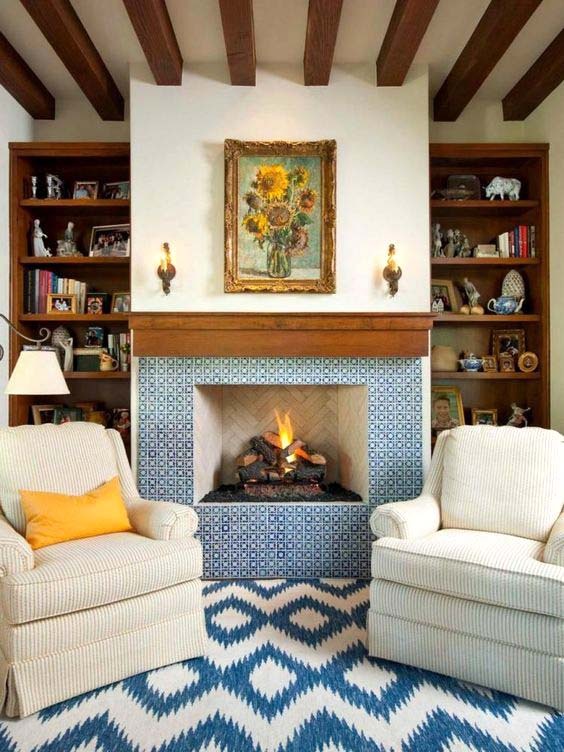 The Mediterranean style tiles in natural colors stylishly frame this fireplace. The mantel plays as an extension of a wooden ledge that hugs the wall and provides space to display greenery in a beautiful pottery, and a basic rustic candle holder. 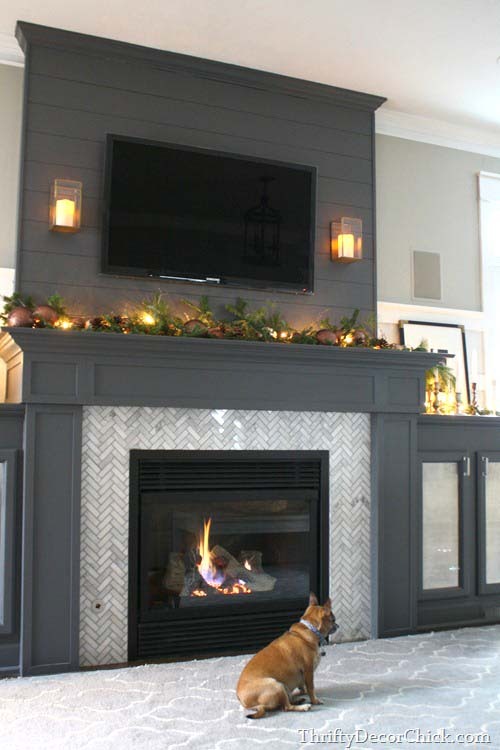 Here is another gorgeous fireplace transformation with tiles from Lowes and some planked wood painted in snow white. The additional elements give a strong breezy feel of the entire space. Since there are tons of various options to choose from when looking for some contemporary fireplace tile ideas, you can give a full freedom to your creativity. You can choose tiles that fit the colors of the walls, the floor or elements in the interior design of the room such as the window treatments, the furniture, or the lighting equipment. Consider the fireplace tiles a different kind of wall decorations. 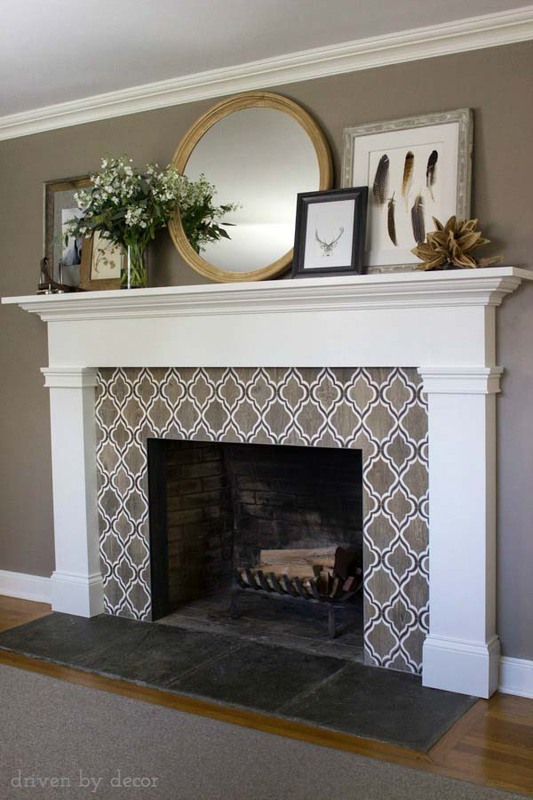 Can you believe this stylish fireplace is being made by a bit of chalk paint, a great stencil (pattern), and… a lot of patience, of course? 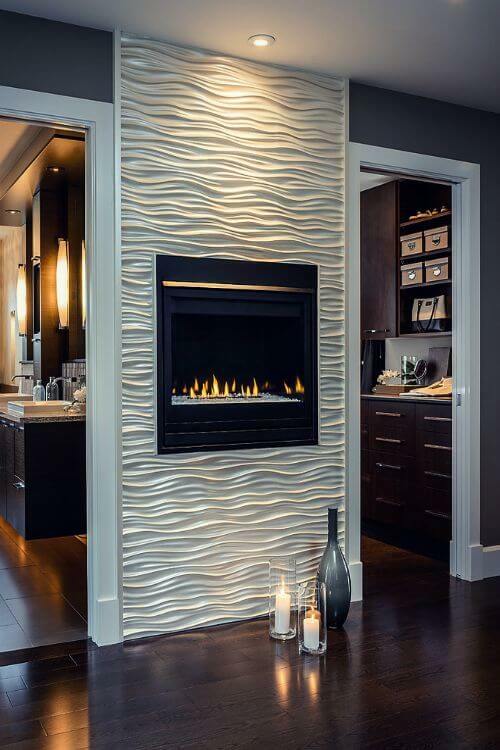 This design surely goes to my list of fireplace tile surround ideas! Hand-painted tiles surely add a strong artisanal appeal to your fireplace surround, but they are quite costly (their price can go up to $50 per square foot?!!). To save some cash, you can just paint affordable plain white tiles before installing them. To do so, you will need a stencil for the pattern and craft paint that is both waterproof and scuff resistant. 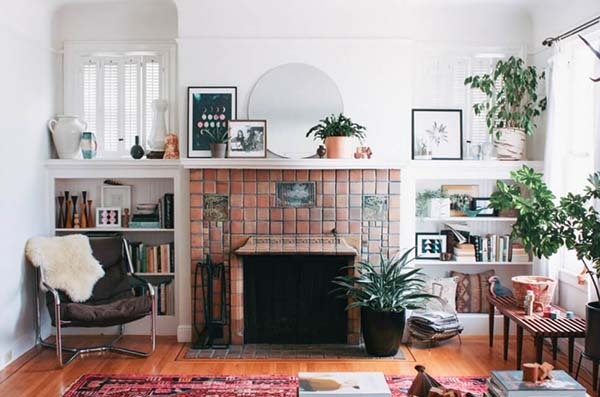 Searching for some fireplace tile design ideas? Take a look at this one in the picture above then! The texture is often neglected when decorating tinier spaces but getting a lovely combination of tactile accessories is just as essential as in a more spacious area – particularly compelling if you have smooth, glossy tiles. The rustic materials, such as timber and rattan, create a strong visual and physical contrast and look amazing when layered up. Finish the look by adding a few cracks of color with spring flowers in an oversized vase. 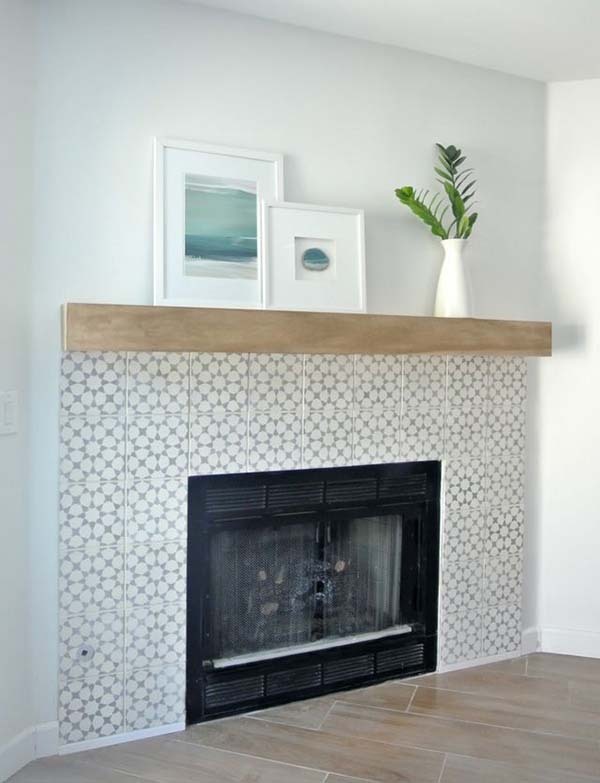 Choosing patterned tiles for reviving your old boring fireplace can create a striking contrast in the entire living room. You can quietly enjoy the result while staying in the sitting area. You don’t need to overemphasize with the decoration of the fireplace in order to bring a contemporary and sophisticated look. Simplicity is timeless. Pick some simple decorative tiles for the mantle and the entire fireplace décor, that will certainly bring your fireplace in focus. 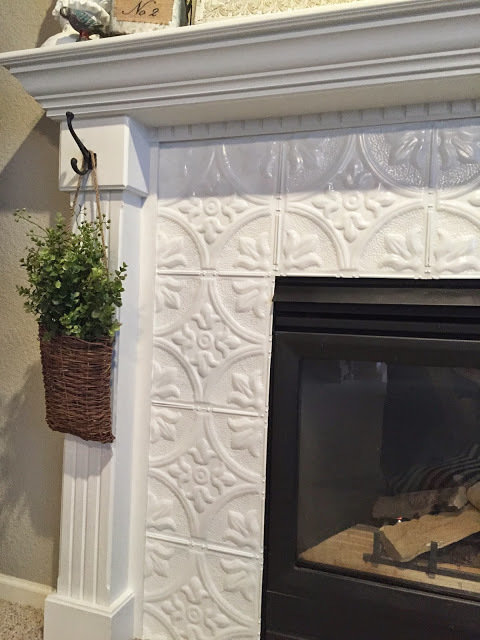 Here is a proof that one of your most favorite tile around fireplace ideas could be easily made for $135 dollars and some free time. 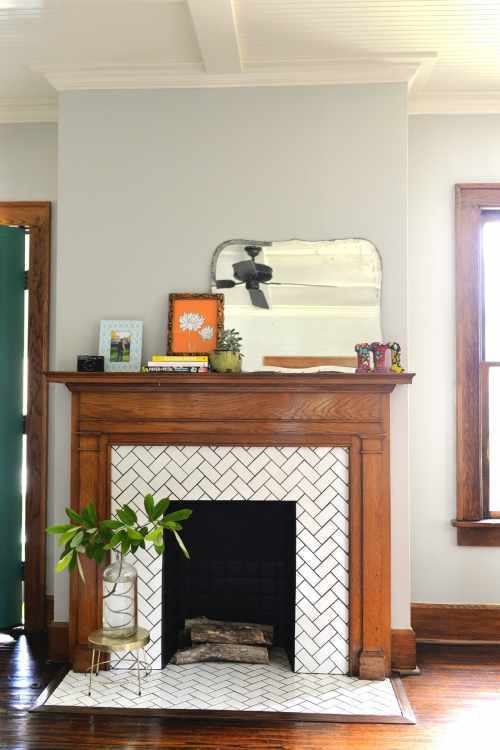 This tin tile fireplace makeover will surely be the new centerpiece in the living room. 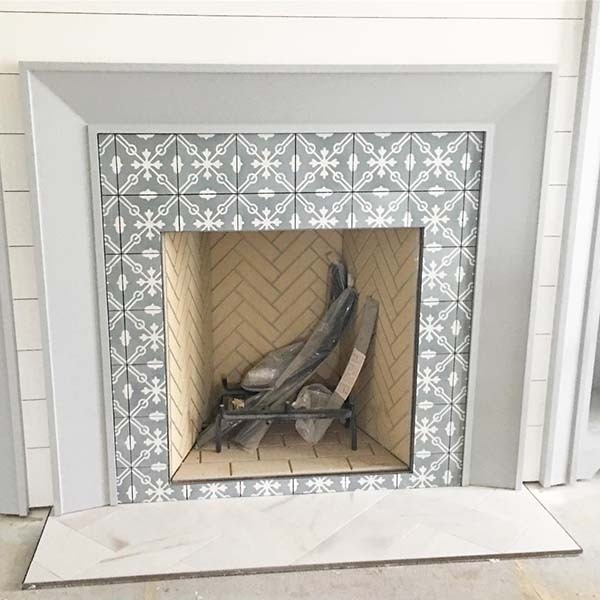 When deciding on tile fireplace ideas, it is essential to choose the right color to either match your existing vibe or make a statement that attracts attention. The white color, for instance, makes an elegant statement and give a stylish look at the entire living room. Add some cool pattern so it won’t turn into a boring fireplace. 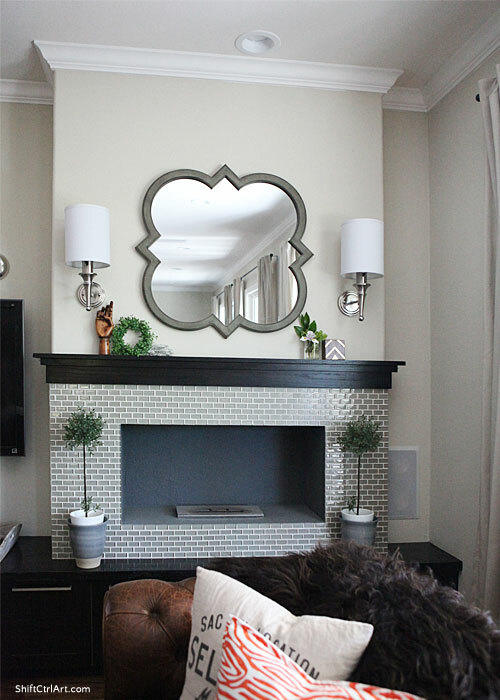 Mosaic tiles will bring your old, boring fireplace at the focal point. When using mosaic tiles on the surround, dare to mix in some different colors and create a vintage-inspired look. The cozy and romantic vibe spread around the fireplace will surely make everyone enjoy in its magic. It gives a strong character to the living space in which it is placed and creates a warm feeling to the person sitting in front of it.